— to first collate a list of movie showtimes, then invite everyone to vote. The script automates the process, eliminating the drudgery and leaving us more time to canvas and cajole support for our favorite films. To kick things off in the gallery, we put together some wacky demos showing what’s possible with a script: you’ll find games of hangman and sudoku, some fractal art and a very practical unit conversion script. You can find these scripts, and more, in the Apps Script gallery by going to Insert and then selecting Script... in any Google spreadsheet. 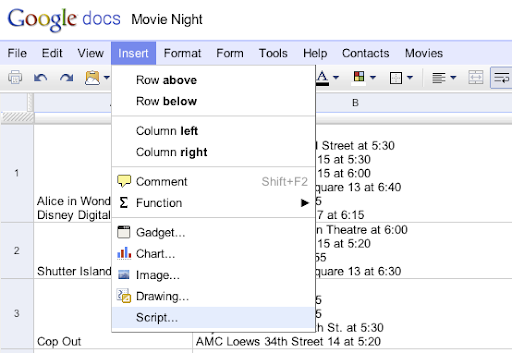 For more details on the Movie Night script, and to get started writing your own scripts, be sure to check out today’s Google Apps Script announcement on the Google Apps Developer Blog. ​Every week, the Google Apps gang here in New York organizes a movie night. It’s always a lot of fun, but organizing it is chaotic! Naturally, we use a spreadsheet to keep a list of movies we’d like to see (that’s the easy part! ), and then on Tuesday evening there’s a storm of email as we try to pick a winner. Always fans of logic and the democratic process, the team wrote a script — to first collate a list of movie showtimes, then invite everyone to vote. The script automates the process, eliminating the drudgery and leaving us more time to canvas and cajole support for our favorite films.